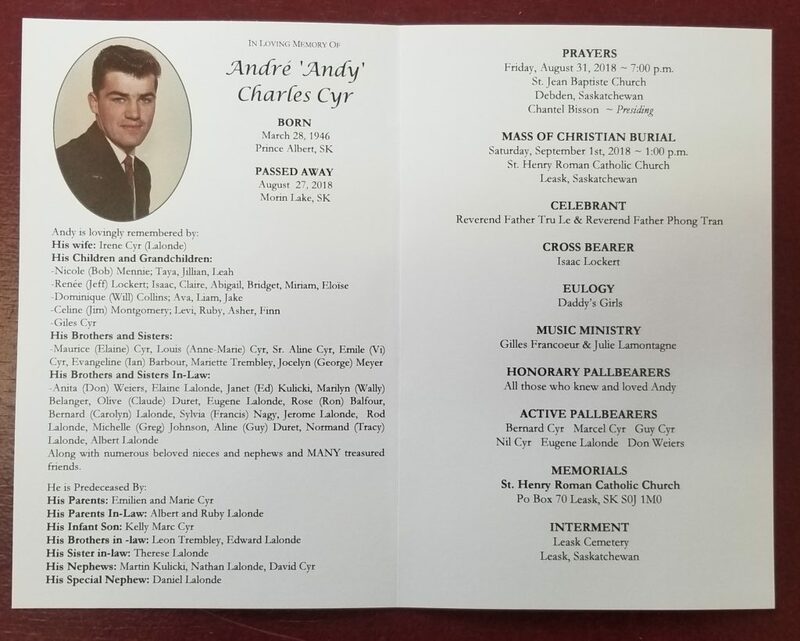 On August 27, 2018, my father-in-law, André (Andy) Charles Cyr died peacefully in his sleep. He was 72 years old. It was a great shock to all of us who loved him dearly, especially his wife Irene and his family. His funeral and the surrounding events were attended by hundreds of people, all whom had been impacted by his life. He enriched my life by his example of faith and hard-work, through his character, and by entrusting his daughter Renée to me as my bride. 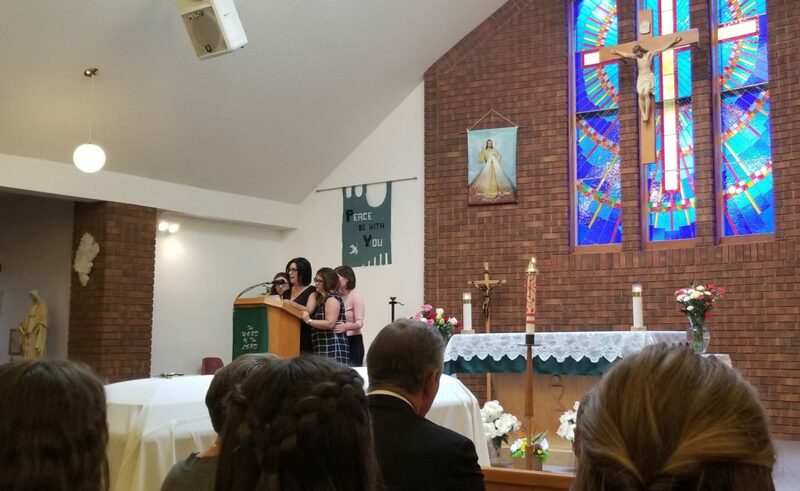 Below is the eulogy presented by his four daughters, Nicole, Renée, Dominique, and Celine, at the funeral in Leask, Saskatchewan on September 1, 2018. We are standing here before you with our hearts broken open and love flowing out in gratitude and thanksgiving for the life of our Dad, Andy. One of his most treasured achievements though, his masterpiece, is right here – this church – St. Henry’s in Leask, Saskatchewan. Look around you. Every brick you see was touched by our Dad’s hands. Every piece was carefully leveled to perfection and every drop of sweat, every sore muscle, every ache and pain he felt while working, he offered up to the Lord in prayer. Dad loved his family. We were his girls, his pride and joy, his world, and we knew it. We knew it because he took every opportunity to tell us and he showed us by always putting us first. But Dad always had more love to give and opened his home and his heart to young Giles. Giles, Dad loved you, his son, our brother. He also poured his fatherly love over Neal, Daniel, Matthew, and Gina. And his grandkids…..oh how he loved his little rub-a-dubs! Watching Dad interact with his grandkids was vision of pure joy, for both Dad and the kids. He had a special relationship with each one of them and he gave them his time, lots and lots of his precious time, to play, and read, and walk, and talk, and cuddle, and listen and laugh! Dad was always positive, always an optimist. Though he had lots of physical challenges over the last several years, including two major surgeries, lots of mobility issues and immense pain, he never lost his smile or his sense of humor. He was always grateful and didn’t like to complain. He found joy in every day. He told me how thankful he was for the excellent and loving care our mom gave him after his surgeries and throughout his pain and suffering. Thank you for loving him mom. Dad was a storyteller. He loved to visit, loved to joke, laugh and share a story, especially over one, or several, cups of coffee. Oh how we will miss the sound of his voice, and that beautiful French accent of his. The grandkids always wanted to open up the “Grandpa Book”, which meant that grandpa would make up a story from “his mouth” … his stories always seemed to include something about, a little boy, a bunny, a tractor, an owl, a mouse, and maybe a frog! Dad was a friend. And the gift of his friendship was something that he gave to everyone. Dad’s brothers and sisters and cousins, you were his first and forever friends. And all of your spouses, you were Dad’s friends. Dad’s brothers-in-law and sisters-in-law, from The Lalonde Family, you were each Dad’s special friend. Dad’s nephews and nieces, from the Cyr and Lalonde Families, you were all Dad’s friends. All those in the Debden and Victoire communities, who grew up with Dad, or worked with Dad, or knew Dad in anyway, you were his friends. The men and women from Leask and area, Dad’s home of 45 years, you were Dad’s dear, dear friends. The people from the Leask Hutterite Colony and Riverbend Hutterite Colony, you were Dad’s treasured friends. My mom, Giles, my sisters, our husbands, all our children, we were each Dad’s friend. Everyone here, from all walks of life, if you knew Andy, you were his friend and he was always happy to see you. But Dad’s best friend of all, the one who was with him always, the one he loved the very most, was his beloved Jesus. 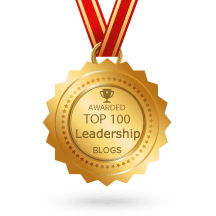 Dad lived a full life and we feel he accomplished everything he needed to. He knew that his children were all grown up and marked with the sign of faith. His girls were all married to fine young men whom he loved as if they were his own sons. 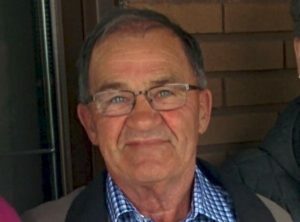 He loved and cuddled, played with and taught all 16 of his grandchildren. And most importantly he knew that all of us together, we would take care of mom. So when Dad’s precious friend Jesus came to visit him last Sunday night and offered take him to live in his brick mansion in the sky, we know that Dad was happy and willing to go. Dad, we hope that you and all your friends in heaven are sitting by the warmth of a wood burning stove, enjoying a cup of coffee (maybe the odd swig of pickle juice), some toast with butter (not margarine) maybe with some molasses and cheese, a little garlic and onion on the side, while playing a game of Duck Lake Rummy and listening to Johnny Cash and Don Williams singing some songs in the background. Till we see you again, our Dad, our friend, keep the warm fire burning for us. Andy’s daughters speaking at the Evening Prayer Vigil in Debden, SK. 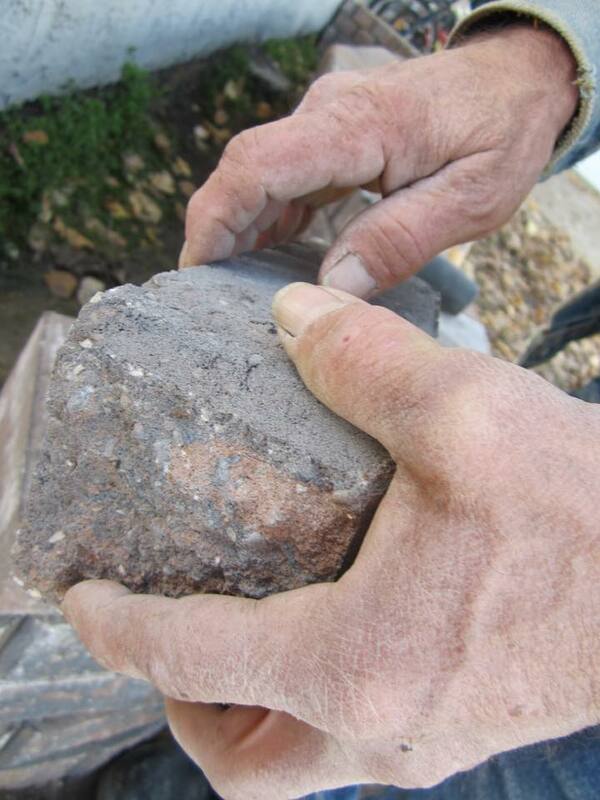 Photo of Andy’s brick-laying hands taken by Nicole while he was building her a brick flowerbed. Andy with a poster of St. 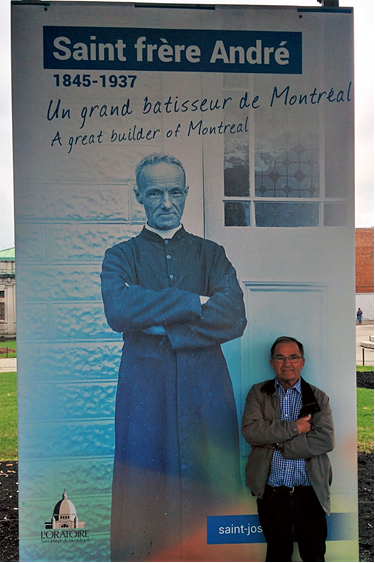 Brother André at St. Joesph’s Oratory in Montreal, QC in May 2018. Andy had a strong devotion to Brother André, his namesake.